Don’t miss out on the exclusive stage 1 release of Ausco Group’s latest project; Haven on Homeleigh. Don’t miss out on the exclusive stage 1 release of Ausco Group’s latest project Haven on Homeleigh. Featuring 59 carefully curated townhomes set in lush green surrounds, Haven is a tranquil place to live and grow. An exceptional family lifestyle awaits nestled in a quiet street, amongst Keysborough’s vast open spaces of immaculate parks and wetlands. 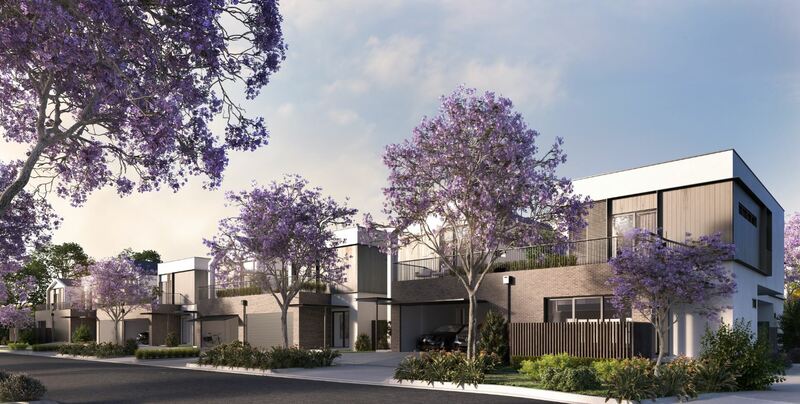 With interiors crafted by renowned Cera Stribley Architects, the 3 and 4 bedroom townhome designs are a sophisticated addition to the booming region of Keysborough. Elegant and timeless, Haven townhomes offer a peaceful retreat perfect for new families or those looking to downsize. With striking, modern facades and carefully planned open spaces; the dining areas flow seamlessly through to large, private courtyards perfect for alfresco entertaining. Step inside and you’ll find a beautiful design aesthetic of neutral and charcoal tones, blended with clever storage solutions throughout your home. From walk-in robes, oversized bathrooms, chef-inspired kitchens with huge islands and private garages, Haven was designed to suit modern family lifestyles. The Keysborough region is complete with abundant amenities close at hand. From peaceful wetlands and parks that stretch for miles to a range of adventure playgrounds, residents will never be short of activities to keep the little ones busy over the weekends and evenings. Other popular spots in the neighbourhood include Springers Leisure Centre, where locals join the offering of fitness classes in the gym facilities or enjoy a casual game of tennis on the courts, while Amrita Yoga is a favourite retreat to find peace and calm. A short 8-minute drive will take you to the sparkling waters of Chelsea Beach on those warmer days and for golfing enthusiasts — Keysborough is home to numerous golf courses including the Southern Golf Club. Haven townhomes are located within close proximity to prestigious schools including Keysborough Primary, Chandler Park Primary, Sirius College, and Haileybury College - all within 15 minutes or less from your Haven townhome. Students will have access to tertiary education at Monash University Peninsula campus, only 12 minutes away. In addition, recent growth in the area has seen an influx in modern conveniences. Local shopping centres, supermarkets, sporting facilities and scope of other amenities will be at your fingertips. Keysborough is connected to the Eastlink and Yarraman train station, allowing quick and convenient access to Melbourne’s CBD, the Mornington Peninsula and everywhere in between. Rest and relax in this quiet calm location, with walking trails, prestigious local schools, sporting hubs, and city connection — Haven has it all. Enquire here for more information on Haven townhomes.